We know if you’re going to spend hours staring at a screen – maybe as the last person standing in a multiplayer online battle arena or completing quests as a fantasy hero – you want it to look real. That’s why we’re excited to share that available for order today, Alienware m15 has become the first 15” light-and-thin gaming laptop to incorporate an OLED display, the gold standard of monitor technology. Ever-responsive to our community, we’ve delivered on what many of you have been asking for, cranking up the cinematic experience to the next level. Dell and Alienware have a long-shared history of being first-to-market with display technology, earning kudos from gamers and media, like TechRadar, which praised our “breathtaking screens.” We’ve introduced some of the industry’s first OLED 4K and 8K monitors, recognizing the ability of Organic Light-Emitting Diode technology (which uses organic semiconductors to create thin, light-emitting panels) to produce deeper black tones and sharper contrast levels. In addition to OLED being offered in the Alienware m15, a 240 Hz option will also be available to order today as well. As most diehard gamers know, a high refresh rate like 240 Hz renders a cleaner image, enhancing gameplay, especially for competitive multiplayer, and makes for an overall more fluid experience. The 240Hz display will give gamers reduced motion blur and faster reaction that’s essential in the heat of the match. A wide color gamut of 100% sRGB renders beautiful graphics and color accurate gameplay, for visually vibrant gameplay. 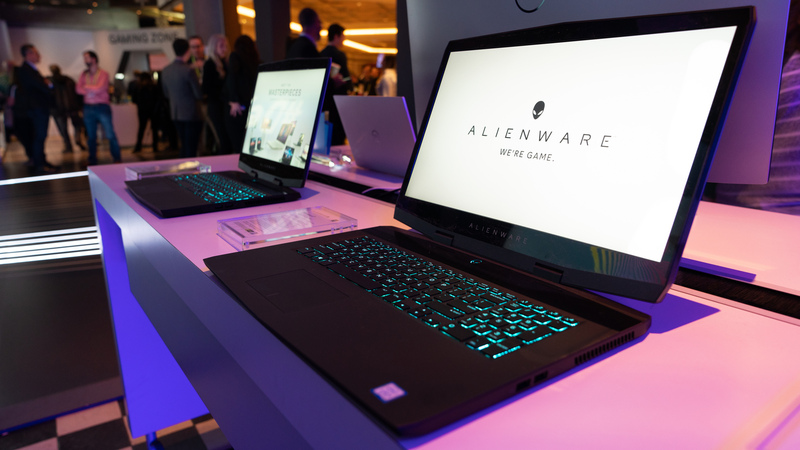 The visual technologies give a winning edge to the Alienware m15, which we introduced as Alienware’s thinnest and lightest 15” gaming notebook, an under-five-pound solution for mobile gamers who value portability without having to sacrifice performance. Powerful enough to handle graphic-intense games, it’s driven by 9th Gen Intel Core processors and NVIDIA 20 Series GPUs with Max Q graphics, delivering up to 16 hours of battery life, making it one of the best no-compromise, thin-and-light gaming laptops on the market. But why should laptop aficionados get all the goodies? For those looking to buy or upgrade a desktop rig, we’ve also begun offering NVIDIA’s GeForce GTX 1660 Ti desktop graphics card, the newest gateway to gaming for the Alienware Aurora R8, Dell Inspiron Gaming Desktop and Dell XPS Tower Special Edition. The GeForce GTX 1660 Ti is built with the breakthrough graphics performance of award-winning NVIDIA Turing architecture, a blazing-fast supercharger for today’s most popular games. It enhances artificial intelligence, programmable shading as well as real-time ray tracing, which enables realistic lighting, shadows and reflections in games. The GTX 1660 Ti also helps you live stream like a pro, with dedicated hardware encoders optimized for Open Broadcaster Software (OBS) delivering 15% improved efficiency over prior cards. Alienware Aurora R8, our compact dual graphics-capable desktop, is a mid-tower designed for everything from 4K gaming up to 12K gaming as well as Oculus VR and HTC/VIVE. Along with a MicroATX motherboard and 9th Gen Intel Core processors, it offers a wealth of tool-less features, maximum airflow for thermal management and AlienFX customizable lighting, among other amenities. Play your favorite titles with brilliant resolution and exceptional frame rates and overclock the NVIDIA GeForce GTX 1660 Ti with Alienware Command Center. Dell Inspiron Gaming Desktop extends the popular Inspiron line with myriad features including VR-ready NVIDIA GeForce GTX 1660 Ti card now available, high-capacity hard drives with SSD and dual-drive options, and Waves MaxxAudio Pro with Performance 7.1 Channel HD audio, among other features. Dell XPS Tower Special Edition is our most powerful XPS desktop ever with the speed of Intel 9th Gen process and NVIDIA GeForce GTX 1660 Ti graphics. The XPS Tower is engineered and designed with purpose for ultimate performance and expandability, designed to run quiet, cool more efficiently, expand easily with a tool-less design and deliver the best sound possible in a desktop. Alienware m15 with OLED and 240 Hz display options are available for order today and starts at $1420.99. Alienware Aurora R8 is available to order today and starts at $1219.99. Dell XPS Tower Special Edition is available for order today and starts at $1199.99. Dell Inspiron Gaming Desktop will be available early April. No matter which rig you prefer, laptop or desktop, you can always count on Dell and Alienware for a much-needed visual spectacle.